Prepare the artichokes for steaming whole, squeezing lemon juice onto the cuts to prevent browning. Set a collapsible steamer basket in a large pot, and add enough water to skim the bottom of the basket. Bring the water to a boil over high heat. Stand the artichokes stem end up in the steamer; fit them snugly, if necessary. Sprinkle the artichokes with salt. Reduce the heat to medium, allowing the water to maintain a low boil. Steam, covered, until the outer leaves release easily when pulled, and the heart and stem are completely tender and can be pierced by a paring knife without resistance, 20 to 30 minutes for medium-size artichokes, and 30 to 40 minutes for large artichokes. Add more water to the pot while cooking, if needed. In a small skillet, heat 2 Tbs. of the oil over medium-high heat. Add the garlic and pepper flakes, and cook, stirring the garlic and tilting the pan to allow the garlic to simmer in a pool of oil at the edge of the pan, until tender and just beginning to turn golden (do not let it brown or burn), 1-1/2 to 2 minutes. Immediately remove from the heat. In a food processor, blend the yogurt and hot oil. Scrape down the bowl, and add the remaining 1 Tbs. of oil, the tarragon, orange zest and juice, shallot, and 1/4 tsp. fine sea salt; blend until smooth. Season to taste with fine sea salt and more orange juice. 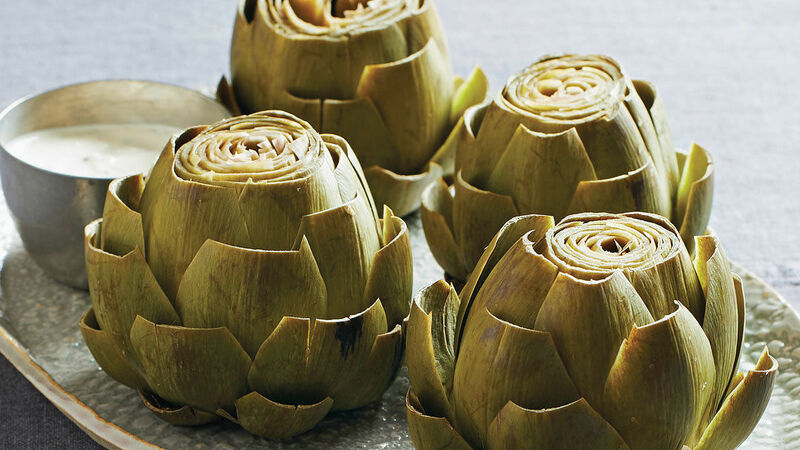 Transfer the dip to a small bowl, sprinkle the artichokes with flaky sea salt, and serve.